Continuing our expose on Target Games line of 28mm games we´ll take a look at their Dark Fantasy game, Chronopia. Today´s market has a vertible overflow of fantasy related games, all claiming to be the definitive game of this hotly contested corner of the gaming industry. Targets Games offering Chronopia is its first attempt into this type of genre. We will discuss the games content, rules and general game play as well as comments on how it compares to other games out there. The core system consists of a 205 page book of which about half are in color and detail the games background. The actual rules are about 50 pages long and in black and white, but the font size is large and quite readable. The remaining pages are the multiple army lists also in color with many examples of their figures. At the end of the book are cut out counters and templates needed for play. Firstborn Swordsman As is obvious the game is only the rulebook. As of yet there is no boxed set available for the basic game. This may be heralded as a boon by gamers who already possess miniatures and therefore only require the rules to play. For the truly new player it may be seen as an obstacle. Overall the book is lavishly decorated and is fun to read. There are however many typographical errors which have been cleared up by target and have been corrected in further printings of the book. The book contains a large amount of forces per army to make the basic rules stand on its own without add-ons. Although these, as in most games, enhance the gaming experience. The game background revolves around the struggles of several races: humans, orks, elves and dwarves. It recounts the defeat and resurgence of the "main" race of humans after a crushing defeat by a coalition of the other races. The resurfacing of mankind also marks the beginning of the game arch-foe the Devout, a for of malevolent chaos driven cult. The current game world has a stalemate between the major factions whilst the foreboding presence of the Devout hangs over all. 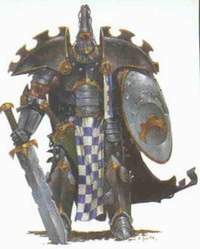 Each race has its own "feel", humans are proud aggressive warrior, elves are decadent elitist, dwarves suspicious isolationists and orks a large arabic style empire with a caste system. The Devout combine elements of the demonic and undead in one force. The background while certainly not innovative it does handle certain aspects very well. The character of the orks as a highly cultured empire with strong organization is certainly refreshing compared to their "childlike" manner in other game systems. 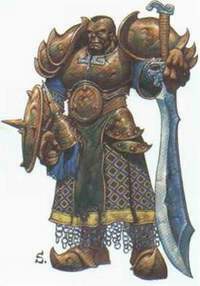 The Dwarves are also handled in a creative manner having a much more "feral" demeanor and wild disposition then the clean cut images usual fantasy depicts them in. The elves have much more darker overtones than the "happy" stance they are mostly portrayed in most games. The background is fun to read and adds its own unique character to the game. Overall it was a good effort on part of Target to create their own world without extremely silly or overly fantastic elements. The system uses the D20 as its basic die type. Similar to Warzone it uses the same stats with some differences. 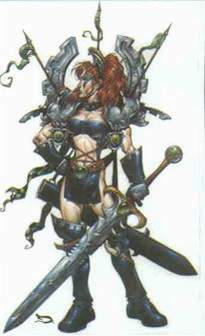 Models possess a move, close combat, missile weapon, armor, strength, action, leadership and wounds. Each stat is explained in the text in an understandable manner. One stat of particular note is the DEF (defensive stat). This relates how good the model is at parrying melee combat weapons. It’s a simple yet ingenous way to indicate a particular models adeptness to parry blows without and overcomplicated system. Each model is allotted a number of actions that will determine "how much" he can do in a given activation. It costs one action to move, fire missile weapon, charge or perform a whole host of possible actions. Units are activated one at a time alternating with the opponent. Who moves first is determined by an initiative roll modified by the model with the highest leadership. Play alternates until all units have moved and another round begins. Firstborn Black Sister Die rolls are determined by rolling UNDER the corresponding stat used after modifiers are applied. In case of close combat the DEF alters the attackers chance to hit an opponent. If successful an armor roll is made by rolling under the armor value minus the strength of the weapon used to hit. Models who fail suffer 1 or more wounds according to the weapon and are removed if no wounds are left. Missile combat is similar in mechanic, but shots are modified by range. Models hit must make an armor save as above. Many rule perks for missile fire like rain of arrows and others make the tactical options enjoyably plentiful. Individual models are enhanced by special abilities that give character to certain units. These include (but are limited to): Hide, Stealth, Immunity, Killing stroke and many others. These skills are easy to apply and usually confer a bonus in close combat or by missile fire. Units are strictly regulating to how many units can be brought to it by the army lists. Elite units are also similarly restricted to produce a balanced army effect. This game is nominally a SKRIMISH game. Units do have a command distance from the leader, but don’t have to conform to a artificial battle formation. The game mechanics make this a game of warband to warband with individual elements ducking out to the death. The rules provide many individual characters for the armies, none of which are overpower to the point to make rank and file troops insignificant. The basic game concepts are very easy to grasp and translate to the tabletop. An average game size is around 750 points with 2 dozen models per side. Play is fluid with few interruptions to look up rules, even for new players. An average game may last 2-3 hours. The game can be played with a limit on turns or for specific objectives. Victory is determined by capturing the objective or slaying more models. The game is very quick to play and the amount of rules anomalies is very small. Ranged fire may by a little too powerful, but that is taken care of by adequate placement of terrain. More importantly individuals DO NOT dominate the game. They die as easily as any other troop. They are a great help but will not win the battle for you. The rank and file are the heart of your force and their adequate use will make or break your game. In virtue of its skirmish nature it make you fell that all your troops participate in battle, not just the ones in the front line. Close combat is very lively and fun the outcome is never a sure given thing, the suspense is always high. Spells and such are appropriate to the armies overall character and none seem to be too powerful. Overall the game is very well done and its execution is simple, but offers many tactical choices. One particular boon is that a game is hardly ever lopsided and can chance very quickly from winning to losing. This uncertainty for victory and suspense makes the game very enjoyable. Although there are quite a few fantasy systems out there my experience is limited to GW’s Fantasy Battles, so I’ll compare these two. No doubt there are systems that will compare very favorably with Chronopia (Fantasy Rules! Has been well reviewed and is popular). Blackblood Orc Swordsman In essence the games try to portray two very different types of combat. Games Workshop’s Fantasy Battles recreated battle formations and strict movements of these formations. Also Fantasy Battles stress the "hero" over the rank and file. Magic and champions are the order of the day and rank and file are unfortunately just filler. There is no real strategy in Fantasy Battle beyond the army selection and magic use. Many battles are determined even before the game begins because one side purchased (or didn’t purchase) some over powerful character or weapon. The victor in Fantasy Battles is always the one who manages to slay the enemies super model. The rank and file can not cope or deal with these super units and the game degenerates into a simple matter of the "bestest with the mostest"
Chronopia is a game where the rank and file DO count and carry the day. Characters although powerful, will not stand unsupported against rank and file for long. Magic is helpful but will not win the battle. Losing your army leader is a bad blow but hardly decreases you chances of winning. Actual tactics over army selection is what will determine the victor. The suspense of not knowing who wins until the very end of the game is a positive factor that GW’s game can never have. In every aspect of game mechanics and play Chronopia outshines Fantasy Battles and to many its rapidly becoming the fantasy game of choice to play. Overall Chronpia is a grade "A" game. The mechanics are well done, easy to use. Actual tactics not uber-characters determine victory. Its skirmish style promotes a healthy interaction between players and all units have worth on the battlefield. Simply put I recommend this game wholeheartedly. Its perhaps one of the best, if not the best fantasy game on the market. In addition to this the ever growing miniatures lines has ver good figures at very reasonable prices. All in all an excellent buy.